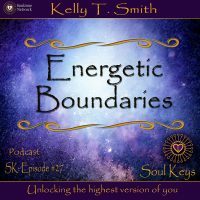 Join Kelly T. Smith for episode #27 as we take a deep look at boundaries, what they mean and how not having energetic boundaries create situations and attract certain types of energies. Learn what beliefs you have that are keeping you from setting boundaries on a physical levels but also learn how on an energetic level you can learn to set an intention in your aura that becomes the energy sign for what you are willing to allow and what you are not willing to allow. If you are a sensitive intuitive or empath it is very helpful to understand that with a simple shift in your intention and by paying attention to what is coming into your energetic awareness you can not only set boundaries that will last but you can change the way others interact with you based on the energy you are sending out. Key#1 What energy doors do you have open without even knowing they are open?